It’s no secret that the US and China viciously compete to gain the upper hand in military dominance. From planting spies, to remotely hacking, this never-ending game of cat-and-mouse has gone on for so long that a different approach has started to emerge. According to Forbes contributor Anders Corr, one of the lead suppliers of military aircraft for China, Aviation Industry Corporation of China (AVIC), has launched efforts to acquire aviation companies based in the US and beyond — around half a dozen were purchased in the last 20 years alone. Recently, after scooping up a small and unprofitable aerospace company from California, AVIC is now in talks to acquire a UK-based aerospace and military company that could prove useful for stealth and drone development. The acquisition of a few of these companies wouldn’t raise red flags; however, the rate at which Chinese companies have been acquiring their western counterparts may be part of an alarming trend. 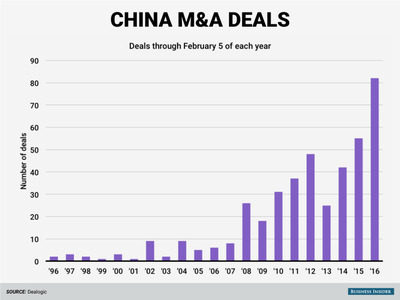 In a 2015 report, there were 103 Chinese acquisitions in the US, compared to the annual average of 13 in 2009. However, owning these western companies doesn’t just translate to immediate ownership of their intellectual property. Many of these technologies fall under US law that explicitly bans providing information that has military applications to China — even after their company has been acquired by them. According to Forbes’ source though, it would be a fairly easy process to circumvent this seemingly restrictive export ban with something like a cyber-attack or taking pictures of the technology. Perhaps the game of cat-and-mouse is just in its initial stages of this evolution and it’s now the US’ turn to act. However, considering the rate at which China has developed their technology, even if the US starts closing these loopholes now, it may already be too late. After the US government forbade China to access Intel’s fastest microprocessors last year, China has recently developed the world’s fastest supercomputer — using only Chinese microprocessors.